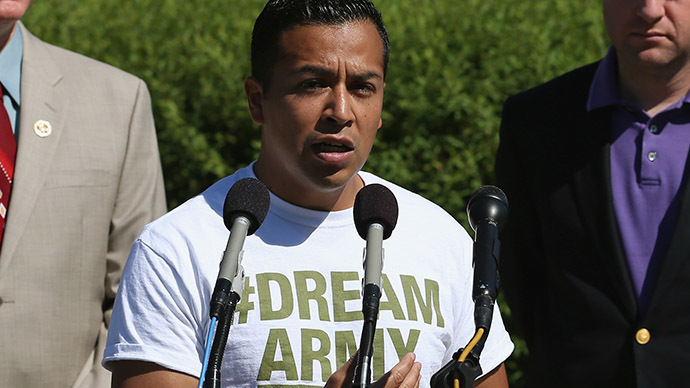 Cesar Vargas’ application to the New York State Bar made the headlines when the state Appellate Court approved his application despite his undocumented status. However, he now says he is receiving death threats, some of which were left on social media, while others were left as recorded messages. “I am going to come and get you”, “Filthy illegal alien” and, “You broke the law,” were some of the messages Vargas, who is the co-director of the prominent immigrant rights group, Dream Action Coalition, received. “You know not everyone is going to be supportive but we can’t just be fearful for fighting for something that’s right,” Vargas told RT. Vargas mentioned that he and his team, who have also received threatening messages, now have to use Google numbers to prevent their phones from being in the public domain. With his newly obtained license to practice law, Vargas says he will specialize in immigration law. “It’s personal and not a big surprise there, but throughout the process, I understood that its not just the legal process, not just immigration system, the whole system needs to be modernized. The system has to be reformed,” he said. Vargas received his law degree in 2011, the same year he passed his New York Bar exam. He was then was accepted into the DACA – the Deferred Action Childhood program, which was established by the Obama Administration. It grants undocumented children temporary work papers and an embargo on deportation. Following the appeal court’s ruling on June 3, Vargas immediately called his mother who brought him to the US when we was only five. Initially Vargas was worried he and his family would be put into the spotlight, but said people needed to know who the undocumented immigrants are.